This Kundan nath adds just the right kind of drama. This bride wore a high neck blouse and lay off the neckpieces. So the heavy nose ring balances it out! This single string nath paired with a matching maang-tikka has its own unique shape! Don’t shy away from really big bridal nose rings. This bride proves that it can look gorgeous! This spunky brides statement silver piece goes perfectly with her pale pink outfit. Such a refreshing change from what we usually see on brides. A smaller but thicker diamond circle with focus on that crescent-shaped kundan piece. 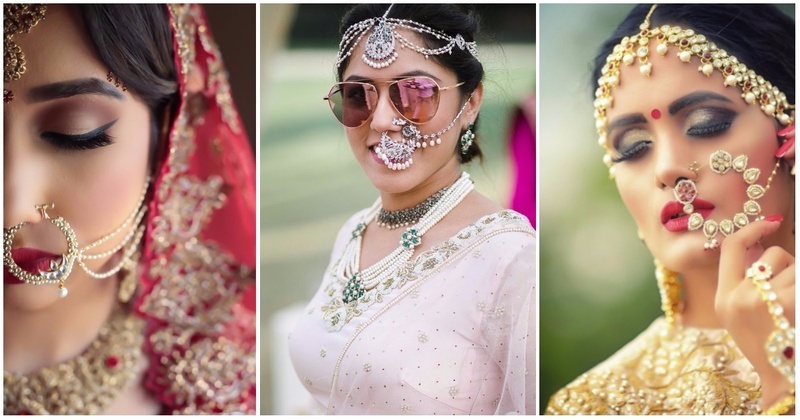 This beautiful bride goes easy on all other jewellery and maintains emphasis on the heavy nose ring. A simple yet stunning bridal nose ring with no strings attached to it. Really wish this was a clearer picture but you can still see how lovely this heavy nose ring looks with all the other jewellery pieces. This triple-strand nose ring has quite a unique shape and design. This bridal nath maintains a simple ring but comes alive with a cluster of diamonds all in one place. Personal favourite! Love this simple ring with dainty floral designs in pearl and kundan.